We are now advertising for a new Secretary to replace Tom. This is an unpaid role but offers a great opportunity for someone to be closely involved at the heart of the Trust and, depending on their experience and aspirations, to develop and demonstrate competencies and skills that will serve them in their wider career. We are also looking for volunteers for a range of activities required to support the secretariat. It will be for the incoming Secretary to agree the roles of such volunteers, to complement their own skills and availability. However, with a membership of around 3,000 and an ever greater variety of communication methods to reach those members, we expect that an increased variety of additional skills and a greater number of volunteer hours will be needed to support the Secretary. The Secretary is a formal and important role set out within the Trust’s Constitution. The Secretary is directly accountable to the board and the membership, providing impartial advice as well as a range of administrative functions, some of which are delegated to members of a wider secretariat. Input into a forthcoming review of the Trust’s Constitution. Depending on the Secretary’s skillset and appetite, there are further opportunities to be involved in developing the Trust’s administrative and communications capabilities and supporting the work of the Trust’s committees and working groups. The basic functions of the Secretary occupy around five hours per week. Some times of the year are busier than others, and the role is at its busiest from October to December, during the elections and lead-in to the Trust’s AGM. The Secretary will be expected to attend board meetings and general meetings, which are (with occasional exceptions) held on weekday evenings. Whilst there are few fixed time commitments outside those meetings, the Secretary is expected to monitor email correspondence regularly throughout the month and to be flexible in the timing of their input. Organised and disciplined – you are someone who plans the work of you and your team in advance and implements it, on time, under your own steam. 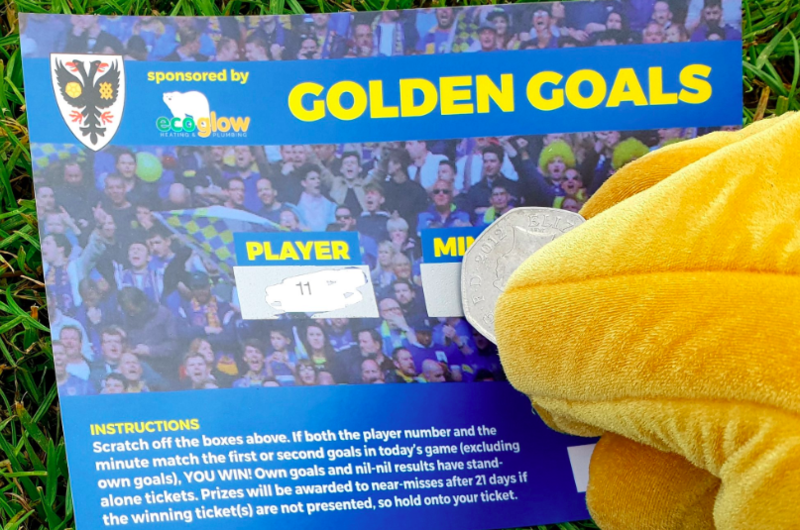 Commitment – you are committed to the Dons Trust as the vehicle for AFC Wimbledon fans to own their Club and to playing your part in making the Trust a shining example of how supporters’ trusts operate. Ability to maintain confidential issues in the strictest confidence. Integrity, impartiality and sensitivity – you are prepared to raise issues of procedure or reputation when necessary, and to support the Chair in ensuring that issues arising within the board, or between board and membership, are handled fairly. Understanding of, or ability to readily absorb and understand, the Dons Trust’s Constitution. Basic level of IT literacy. An understanding of, or ready ability to learn about, the legal and regulatory environment for Registered Societies such as the Dons Trust. Understanding of, or ready ability to learn about, data protection legislation. The Trust is committed to equal opportunities and welcomes applications from people with a wide range of backgrounds. The role would lend itself well to a recently retired, or semi-retired, professional person or administrator, with an appetite to apply their experience base in the service of the Trust. Equally, applications are welcomed from candidates at an earlier stage in their career, wanting to develop their skills and competencies. 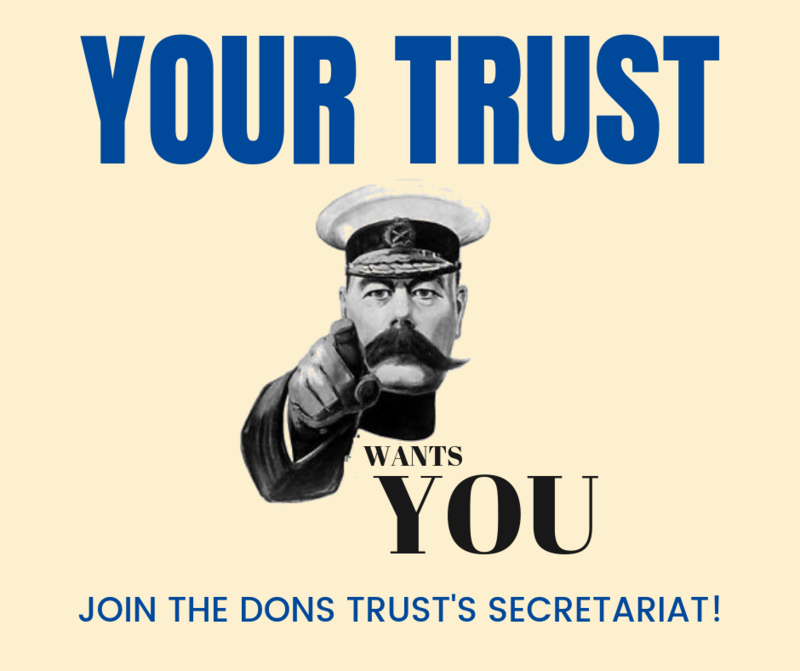 You are encouraged to contact the Trust’s Chair Mark Davis (via mark.davis@thedonstrust.org) or current Secretary Tom Brown (via secretary@thedonstrust.org) to find out more about the role. Applications should be sent to Mark Davis (email as above) by 30 November and should include a CV, a covering letter setting out what you bring to the role and why you want to take it on and the name of someone who will be able to provide a personal reference. Besides the Secretary, the Trust is supported by a secretariat of volunteers who perform a valuable range of functions, including minute-taking, sending out communications through a range of electronic and physical media, updating our website and social media, and administering our membership systems. The growth and development of the Trust and Club means that there is an increasing number of skills, activities and tasks that we need from our secretariat. We also need greater strength in depth, to cover times when other members of the secretariat are unavailable. Support for the Trust’s website and social media platforms, including Twitter and Webjam. The skills required will vary, depending on which tasks you can help with, but members offering familiarity with a range of IT applications (MailChimp, SurveyMonkey, WordPress, etc), and applications from members who can be called upon to undertake tasks at short notice (including during the working day) will be very welcome. For those tasks involving handling of data, an ability to maintain the confidentiality of personal and other data is essential. It is not currently contemplated that these tasks will require attendance at board meetings. The time commitment is expected to be modest. 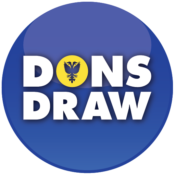 If you have something to offer in the above areas, please email mark.davis@thedonstrust.org setting out the area of activity you would be interested in supporting, the skills you have to offer and your availability. This entry was posted in News and tagged volunteering. Bookmark the permalink.